Did you know I was a teacher? The first day of school, when the classroom sits sparkling and perfectly organized and ready, anxiously awaiting its new occupants. Fresh books and pencils and nametags taped 'just so' to each desk. The moment you get your class list and wonder about what each child will be like and which ones you'll grow particularly attached to. Making hundreds of copies for that first week of school. The sound of the copier whirring them out, and the piles of packets and worksheets and books and things on every classroom surface. The walking back and forth to the office on prep day with one thing after another, chatting with the other teachers at your box in the office and in the lunch room. The fun activities you get to plan for the first 'getting to know each other' week. The moment the kids walk tentatively into the room and wander around shyly, looking for their desks. I know school started a while ago in most parts of the country, but around here it starts this week. I miss so many aspects of being a part of a school community. For those of you with little ones in public school, I know there's a lot of bad press out there about it, but do take heart: in my personal experience at least, our schools are one amazing community to be a part of. I look forward to the days when my boys get to experience the nurturing world of the elementary school campus. And I still think fondly of the math based cooking units, the fascinating history simulations that brought our students back in time, the P.E. games in which the students were amazed that Mrs. Woodard could beat the best kid in handball, and the general excitement that teaching and learning bring. Welcome back, school days! I hope those of you who are in that phase of life are enjoying it. P.S. I just returned from an amazing photography seminar and will update you about it just as soon as I can! Beautiful blueberries make for beautiful muffins. After a light dinner of Jake's and Tyler's all time favorite meal (this salmon recipe...yes, salmon!) I decided we'd have blueberry muffins for dessert. With white flour! How decadent. My husband was thrilled about the white flour part. I did sneak in 3/4 c. of whole wheat, but left the other cup white. So delicious. I won't share a recipe for these, as I kind of combined an old Betty Crocker cookbook muffin with a crumbly topping from the internet, and will probably tweak in the future. I had lots of crumble leftover, so I just sprinkled over a dish of plain blueberries and baked it along with the muffins. I've been picking at it ever since. Yum. And really, don't the muffins look beautiful in the sunlight streaming into my kitchen? I certainly hope not, because it sure is a lot of fun. No one report us for child abuse, please. Oh yes, the disclaimer: No children were harmed in the filming of this event. P.S. Photos taken with a high shutter speed to stop the action (my SLR camera set on TV mode) with a bounce flash off the ceiling...if you don't have an external flash yet for your SLR, get one! I've purposely kept all my ceilings white in the house so indoor flash pictures look natural, by aiming the flash at the ceiling for this bounce flash look. (And how often do you shoot with a flash in the house? my husband would ask...good point. Okay, so the ceilings are white because I'm lazy.) Although I do admit the lighting in these is rather surreal looking, but I think it works with this subject. I say boy outing, because I'm not sure about girls, but all of the preschool boys I know are obsessed with trains. One of our favorite outings is to go to the train station just to watch the trains roll in. We've discovered that this is more of a breakfast time outing, as the trains are few and far between at lunch. Living in the suburbs (halfway between San Diego and Los Angeles) means that the commuters pack the train station between 8:00 and 9:15, which is just the perfect time for an early morning outing. Early morning is my favorite time for outings...to the beach, the train station, the meadow, anywhere, really. The fog hasn't quite burned off, and we get a bit of that chill in the air that some of you who live where there's real weather probably get all the time in fall and spring. Sometimes we stop at the donut shop on the way to the station, and every once in awhile now, we have someone to pick up from the trains, now that Amy's living in San Diego. One of my favorite things about being a parent is that I can do all sorts of things with the boys that would make people look at me funny if it was just me. (What's that weird lady doing standing around by herself watching the commuter trains come in and go out?) I love discovering free outings that get us all outside and watching the world unfold, don't you? It's so amazing to experience a little childlike wonder for the world around us, isn't it? Two things have morphed a bit in recent days, in a way that's making our lives quite a bit more serene, more wholesome lately. There's a new way of seeing books and television around here. First of all, you do remember my severe love of books, don't you? It has always been my deepest desire that my boys would love reading. That they would crave it, like I always did and do. I have counted down the days and years until they are old enough to sit with me and read out of novels, real novels, along with the picture books they have learned to adore from almost their first days. This year Jake and I have (finally!) begun reading the Little House on the Prairie series, my absolute favorite books of childhood (and as it turns out, adulthood!) He sits and listens, amazed at the life back then, and I think I'm loving it even more than he is. Those books offer the perfect antidote for modern life...easy, unhurried, full of family moments. Tyler, on the other hand, is still not interested in sitting with us for the many pages without pictures, but he seems to have an innate love of thumbing through book after book after book after book, as life moves on around him. I already dream of the day that he'll be old enough for us to reread the Little House books and see them again through his eyes. On the other hand, television. It's a bit like drinking, to me. In small doses, quite nice. In excess, a very bad thing...for your mind, your soul, your family relationships, your faith, your self image... I will say that I have always used t.v. like medicine around here. A little bit of PBS goes a long way towards sanity for a mother of two preschoolers. Do you remember that fog that is life during the early mothering years? At times, television was my savior. When I needed escape and a moment to myself, or just to cook dinner or empty the dishwasher without someone climbing into it and pulling out the knives, t.v. came to my rescue. The DVR is our friend, making our short list of acceptable kids' shows available at any time I needed it. My favorites: Mister Rogers, Zoboomafoo, Curious George, Between the Lions, generally anything uplifting, educational, and slow paced, and with the DVR we always fast-forward through any commercials. Still, every time I turned on the t.v. for a moment, I felt guilty, as if I couldn't quite handle things on my own. But there it is, it did help me through. And hubby and I do enjoy catching our favorite dramas together and theorizing endlessly about them...it's like having a standing date on the couch without having to pay for a babysitter. So today, I'm finding a balance. It's my "new-old-fashioned life" theory. Take the best of the modern world (DVR) and leave the rest of it (non-stop screen time). I'm in the beginning of week four of my t.v. experiment with the boys. Four weeks ago I felt that I was finally ready for this trial that I've been thinking about for months, even years, I guess. No t.v. during the day. Really, it's not a huge change for them, as they watched at the very most 40 minutes, but it's a change for me. T.V. has been a great boredom breaker, a great fight ender, a great distraction when everyone's cranky, a generally great fall back plan. When I didn't know quite what else to say or what to suggest, "Let's watch a show," was always met with great enthusiasm from us all. Now I'm mothering without a net, so to speak. So far, so good. In the past three weeks I've turned on the t.v. twice for them: once in order to pack our stuff up for the beach, and that was on day one. Looking back, I probably could have avoided it, but didn't know better. The second time was just on Friday, when I was having one of those blah days where nothing quite felt right, and Greg had been gone several nights and I just needed a break. But generally, I have decided that whenever the boys ask to watch a show, I will stop what I'm doing and say, "No, but let's sit together and read a book," and it works! And at times when I feel the need to make the suggestion of t.v. myself, I'm training myself to wait it out for a few moments and see if the storm fades back into peace on its own. Best of all, we are, as I like to tell Jake, going on an adventure in our imaginations together. And I'm loving it. I'm so thankful for the way life moves a family, taking us from surviving just a year ago, to thriving today. Tonight we had the perfect southern dinner. I realized as we ate it that I really have no idea what a southerner's idea of a perfect southern dinner is (if you're from the south, do comment and let us know! ), so I figured this could just be the perfect southern california summer dinner. So there you have it. And it was really so easy! We had a rack of pork ribs, which I like best baked first so they're ever so tender and juicy, then finished off on the barbecue for about 20 minutes to get a little of those delicious crispy edges. Lots of bbq sauce from our favorite southern restaurant nearby. While those baked, I threw a can each of kidney and white northern beans into a pot, along with more bbq sauce and about a half cup of Trader Joe's tomatoless corn salsa for some kick. I let that simmer while the ribs were on the grill. Boiled up some water in the meantime for our fresh from the farm corn, and cut up our very first watermelon of the season! What a perfect way to end a day of sewing and busily preparing for my etsy shop opening later this week. Oh, yes. Hard work, yummy food. Good day. ...and two favorite magazines to skim. Look who we found outside of our back door! This crafty, colorful spider and her prey. Do you notice that her bug is nearly twice her size? She's working hard. I thought for sure that she wouldn't be able to wrap him up enough to keep him from getting away. Nobody would blame her if it turned out that the task was too big for her, or if she rationalized that it wasn't worth her time to tackle something so big. But she didn't give up, get lazy or get distracted; she kept at it. The boys and I watched the bug try to wriggle away, but our spider friend worked quickly and diligently, never wavering. And my, did she have a nice (big!) dinner as her reward. I'm hoping to have a rewarding day, too. I haven't mentioned it often here, but I used to be quite the prolific card stamper. I love deliberating about the color combinations, fiddling around with the layouts, and most of all, I love having handmade cards to send to people when they need it. The things you can stamp are so much more beautiful, and of course, meaningful, than something you can buy in the store. And it doesn't hurt that if I stamp enough, it ends up being much less expensive than a store. Can't beat that. As I've been on a bit of a sewing binge lately, I haven't stamped much, but I do have an order of beautiful new stamps being delivered in the next week, and I can't wait to get my hands onto paper crafting again soon! My favorite stamp lately is from Stampin' Up! and is a single stamp called Riot of Petals. At $18, it was very pricey, but I have used it so much that I know I've definitely gotten my money's worth. Sometimes I spend a bunch of little bits of cash on things I don't ever use, and really, this big bit of cash was better spent, don't you think? I thought I'd share a few favorite cards with this stamp to get you in the mood for the return of paper crafting! And one last card making idea (non stamping related)... for my grandmother's 95th (yes, 95!) birthday, I had Jake draw a picture and I scanned it and printed it to put on some cards with a few little embellishments for her to send to her friends when she writes little notes. Tyler scribbled away on sheet after sheet, which I cut up and did the same thing with, and she just loved her present. Here's what I mean, if that's not very clear. It's a great inexpensive but meaningful present for grandparents. Enjoy! I loved that the presents were books instead of more toys, and I especially loved taking pictures of the kids silhouetted against the setting sun. 1. The tomato hornworm in this post did not make it into a cocoon. When he started pooping too much all over the bugbox, we moved the box outside and then forgot about it. Serves him right for eating my heirloom green zebra tomatoes all up. 3. I am still working on the quilt mentioned here, but got distracted with some cheery yellow fabric and started working on a yellow beach quilt. I am not a good finisher. 4. The fairies mentioned here sit waiting for a fairy garden home. I am definitely going to make a few fairy gardens, but fall is coming and is very busy for us, so they may have to wait until spring. As I said, I am not a good finisher. 5. The laundry habit, I am proud to say, has been going quite well. It's amazing what can happen when you simply decide that you're going to change and then every day do the hard work to follow through with it. I do have one load upstairs right now that has not been put away, but is folded and waiting, and I do not have several loads on the couch. And that is an improvement. I hope you're all having a wonderful weekend. I'm off to bake some prehistoric goodies! Less than a quarter mile outside of our front door today, we find this. All kinds of people. Two people hoping to become president. People looking for tickets. Loud people. Excited people. Desperate people. Crazy people. Normal people. News people. Ron Paul people and McCain people and Obama people and people whose signs seem to imply that they're against just about everyone and everything. Law enforcement people. Saddleback Church people. People interviewing other people. People of every color from all over the county and perhaps the state are gathered, shouting, just a few minutes walk from my front door. People who have a voice and are raising it in peace. Driving past it all several times on my errands today, the thing that struck me most was not one group or one idea, but a deep sense of gratitude for the freedom being exercised right now, just outside of my front door. 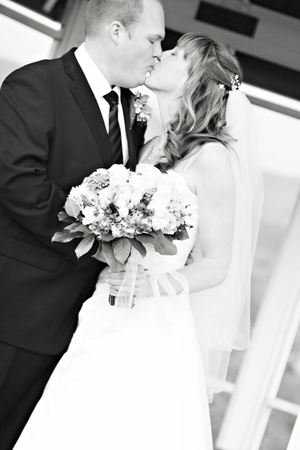 Happy (six month) Anniversary, Amy & Rob! I started this blog at a time when my life was thankfully beginning to slow down. I had emerged from the fog that is having a one and three year old, and after a February that involved all three of my boys' birthdays, our annual huge Super Bowl party, a bachelorette party weekend and a wedding (both of which I was planning), I was feeling very free. Six months ago today, my dear sister Amy (whom you've heard me mention often here) married Uncle Rob (as he's come to be known around our house.) It was a feat of frugal but elegant planning on the part of Amy and myself, and it turned out to be one of the most beautiful weddings I've been to. If you know me at all, you know there's a true country girl hiding in this suburban housewife, and my sister is no different. 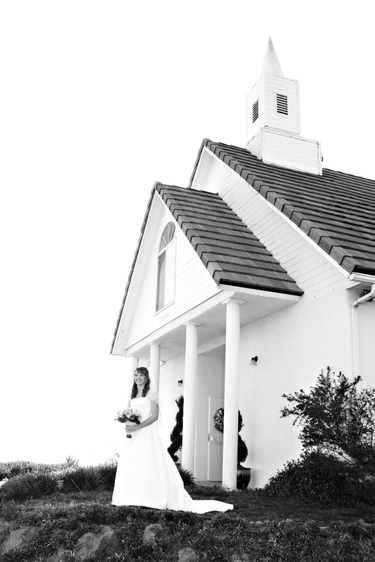 She chose the church long before she chose the husband; it has a quaint white steeple and sits so perfectly atop the foothills (the church, not the husband.) It fit the mood of the wedding, which she and I dubbed "small town country picnic," perfectly. 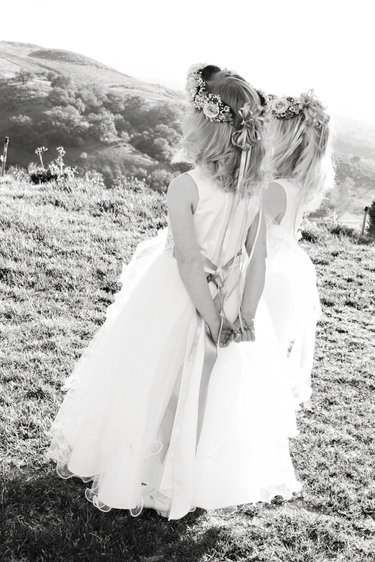 The two flower girls definitely got their fair share of attention from the congregation, as they were just beautiful, and so perfectly behaved. 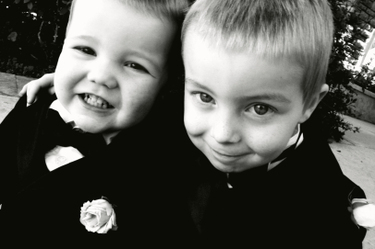 This I cannot say for my two little guys, whom I refer to as the flower boys, although I know they were officially ring bearers (why can I never remember that?) Boy number one took two steps down the aisle, then turned back to the rear of the church, where I had to pick him up and carry him, scowling, down the aisle, throwing his pillow to the ground in the process. 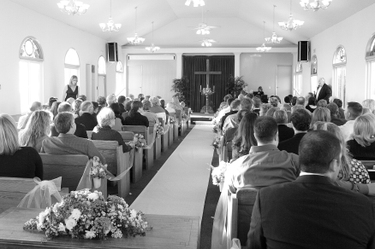 How's that for a little wedding excitement? Boy #2 told me moments before walking down the aisle, "No A' Amy's weh-ing," to which I replied, "No, we're not having Auntie Amy's wedding. You just need to go downstairs and walk down the aisle to sit with Sara and she'll give you a treat." And that was good enough for him. Here the two handsome fellow are, looking oh-so-innocent. 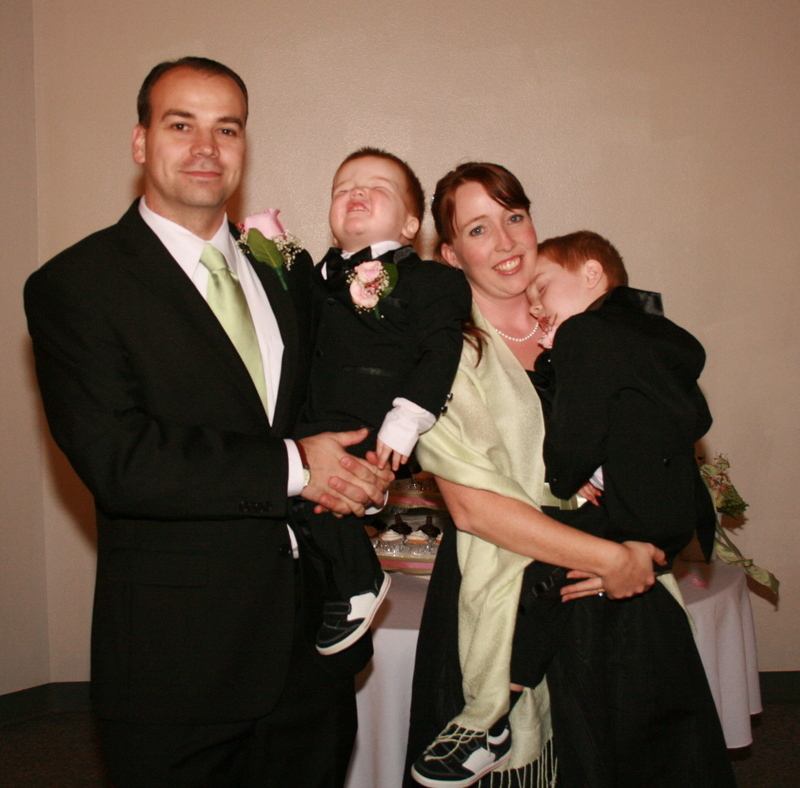 Did you want to see a family portrait from the wedding day? I thought you would. Just wait, it's gorgeous. This would be the happy family: Greg, groomsman recovering from a week of the flu; Tyler, flower boy who makes this handsome face whenever he's asked to say cheese; Jake, flower boy who came down with the flu that morning; and Linn, matron of honor trying to hold it all together. Aren't we lovely? In the end, all that matters is that the wedding was Amy's perfect country style wedding, and that she and Rob will live happily ever after, just as it should be. 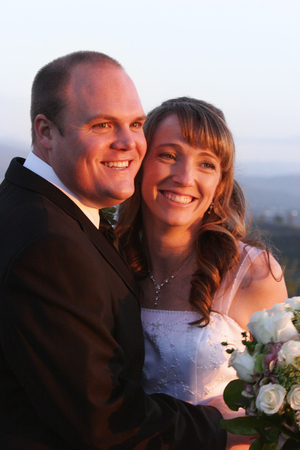 Happy Anniversary, Amy & Rob! This will be a random post about several deliciously unconnected food adventures of late. First and, I think, best, is this beautiful Blueberry/Blackberry Galette. I had to borrow Cooking Light's photo, as mine looked terribly unappetizing. (Thank you Cooking Light!) It makes me appreciate food stylists and photographers. Anyway, I made this two nights ago and I loved it. I used all whole wheat flour along with the cornmeal for the crust, and I thought the crust was delicious. (I did not roll the circle out big enough before loading the berries and baking it, so the bottom of mine didn't cook all the way through. Next time I will measure and get the full 15 inch circle out of it!) But the inside was sweet and summery and the crust, as I said, was delicious, whole wheat flour and all. It was not hard to make, either. Watch out, though, because mine did leak. And I have not forgotten my promise to share my whole wheat chocolate chip cookie recipe! I would've made it today, but someone else from our fellowship group volunteered to bring brownies for tonight's study, so the cookies will have to wait. I did buy the chocolate chips today, though, so I'm ready. Perhaps sometime this weekend? Happy eating!